In our first regular episode for 2017, I catch up with Adam McDaniel who talks about his Richard Amsel documentary, Official IndyCast Correspondent Mitch Hallock looks at Raiders gaffes, Chris A is back with another instalment of IJ in the UK, Ron returns with another bite-sized Indy fun fact, Double T's looks at the White Witch and we have more of your great emails. 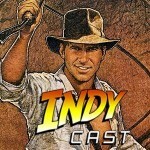 Just what is Indy canon now Disney own the franchise? Could a Lego Dimensions Indy pack look like this?